With the tragic closing of Quenchers and the recent demise of Howells & Hood and Northdown Café & Tap, change is coming to Chicago’s craft beer bar scene. And while many of the city’s longtime beer bar big boys remain the same, there are some notable new entrants to the increasingly crowded list. These days a solid selection of craft beer on tap (with at least a few local options) is a baseline expectation rather than the exception to the rule. This also means it becomes harder and harder for bars to stand out on the merits of their beer game. 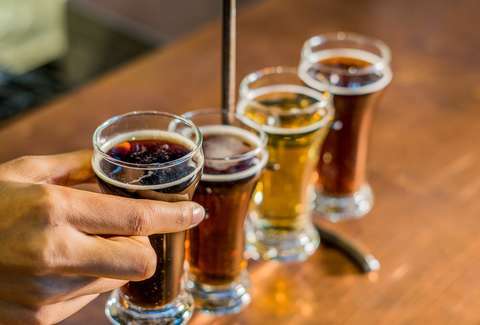 When it comes to the bars that rise above the rest, that reliably deliver that unbeatable “there are so many beers here I haven’t tried and I want them all right now” experience, these are the places you must seek out. Note: This list is not meant to include breweries. You can see that list here. 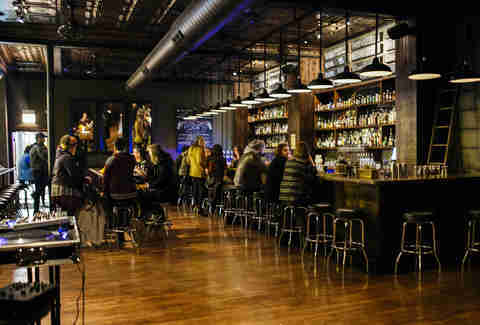 Revolution, Half Acre, Haymarket, and the like are great places, and you should drink at them (and probably do). No disrespect meant, we’re just treating them as a separate category. The folks behind High Dive and Rocking Horse took over the longtime liquor store that presided over the Milwaukee/Diversey/Kimball intersection a few years back, outfitted it with a spacious and comfortable wood-laden taproom, and the rest is history. When you step in and scan the chalkboard panels above the bar touting the 24-strong tap list (they might be changing one out as you're perusing; it turns over fast) you might find yourself paralyzed with indecision figuring out whether to go with, say, a Three Floyds Savage Flow or an Off Color Miscellanea. Luckily they happily do beer flights and 5 oz.-pours so you can cycle through your targets quickly and efficiently. In non-beer but nonetheless important news, there’s live music Sundays and Tuesday nights, and the shot dice are as entertaining and dangerous as they sound. Also important: they don't serve food, but Dante's Pizza (which they also own) is close by if there's booze that needs soaking up. And there will be. Oh, and did we mention there are an additional 180 bottles and 52 cans to choose from? Because there are. After a Cubs game, let those with less refined tastes pile into the slightly more geographically convenient Clark St bars. You're heading a bit further South to Sheffield's for many a fine beer and some BBQ. Better yet, go here when there isn't a Cubs home game. The beer garden is legendary, as is the beer selection. 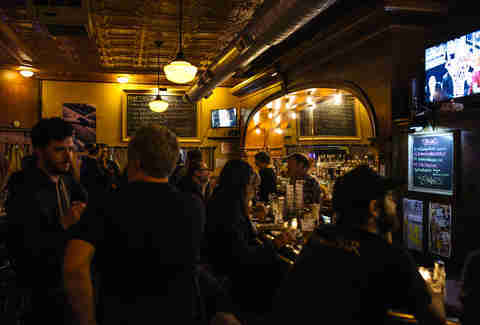 Pros know that the best action can be found at "Beer School" -- the bar-within-the-bar inner sanctum offering its own particularly eclectic tap list and particularly knowledgeable barkeeps. For more beer nerdom, cycle through their website’s “Beerpod” podcasts. Bangers = Sausage. Lace = The foamy remnants left behind on the glass from the beer you consumed washing-down said sausage. Those Two Combined = You, happy. Truth be told, while the encased meat fare here is definitely a positive, if you go just for the beer, you won’t be disappointed, either. The 32-strong, deep-cut tap list is constantly refreshing with everything from one-off local collabs to international brews you may not be able to pronounce. Pro tip: try a flight from the Six Pack, the six beers at the bottom of the menu that usually represents the most unusual/rare of whatever they’re tapping. As an added plus, they now offer 3-oz pours of any of their beers. Such is the demand for the glory of this Andersonville mainstay, that even with the purchase of the neighboring building to make for additional room (and a most-welcome expanded kitchen), it remains perpetually packed. With 68 draft lines and a ridiculously deep collection of more than 400 bottles, you won't find a better lineup of Belgian brews in the city, and their stateside lineup is also a force to be reckoned with. To throw back a few beers at Hopleaf while powering through piles of moules-frites is to know happiness. Remodeled and renamed several years back for the owners' mother who ran this Bridgeport staple for years under the name Kaplan's Liquors, Maria's still has the soul of a dive, but is now combined with more contemporary appointments like chandeliers made of beer bottles. Oh, and they have a mind-bogglingly 500-700 beers for you to choose from, owed in part to the adjoining bottle shop, but also a reliably killer tap list. You're going to like drinking here. You're also going to like eating here, because their Kimski counter service restaurant is serving up inspired Korean-Polish street food six days a week in the back of the bar (closed Mondays.) Maria’s also has their hands in many a beer-soaked pie, from the founding of Marz Community Brewing (helmed by Maria’s co-founder Ed Marszewski) to publication of the craft beer-focused Mash Tun Journal. The bar refers to itself as the Logan Square location but really it's just north of the border in Avondale -- no matter, because where there while there were once upon a time three Small Bar locations, now only one remains, sitting on a quiet stretch of Albany just as cozy and snug as the name would suggest. As the name would suggest this isn't the place to come looking for 50 taps (they have nine taps to go along with 76 bottles and cans), but even the most cynical beer nerd will inevitably find something that makes him (or her!) say "oh damn, I really want to try that." Slip through the kitchen and into the laid-back patio, order up a burger, and you'll feel like you're at a backyard BBQ hosted by a friend with incredible taste in beer and an abundant supply of tater tots. Another one of the OG Chicago beer bars (opened in 1992), The Map Room dubs itself “A Traveller’s Tavern” (see the flags? ), and appropriately, anytime a beer geek is passing through Chicago, this is typically one of their pilgrimages. They’ve been in the game long enough to have struck up some deep ties in the brewing community, which means you’ll find yourself saying things like, “I’ve never seen that on tap before” when you start perusing the 27-tap and 121-bottle list. They also host regular Beer School meetings to help you navigate their menu (and all the others) with even more confidence. They’re cash only. Come ready to spend some on delicious beer. You could knock this place for a cutesy name and concept -- at this "beer cafe" you get your beers not from a bartender but a "beerista", etc. But look, nomenclature aside it's a bit different than any other place in Chicago and a valuable addition to the craft beer ecosystem, with cooler upon cooler of alphabetized bottles (375-400 in total, about which two-thirds are local) you can take home in a mix-and-match six pack or drink right there on the premises for an upcharge. If you're more a draft devotee, the 14-beer taplist always makes for some interesting pints or flights. The free wi-fi befits the atmosphere, which really does skew a little more cafe than bar, so if you have a work-from-home gig and feel like you can be productive with a beer or two in you, it's also an underrated spot to get some work done. You can also bring your own food, which means you might be sticking around for a while. One of the most beloved Chicago “slashies” (aka half bar/half liquor stores) got a more sophisticated upgrade after recently moving from its longtime Jefferson Park location to new digs down the street in Portage Park. While the bottle shop has been in operation since last fall, the newly opened bar area features a handsome collection of brick walls and mural-style wall art adorned with snazzy red and black bar stools. Choose from 24 craft brews on tap (including Tripel Karmeliet and Zombie Dust) while exploring Fischman’s first-ever food menu, which includes everything from burgers and homemade sausage sandwiches to chorizo mussels and garlic cilantro ribs. 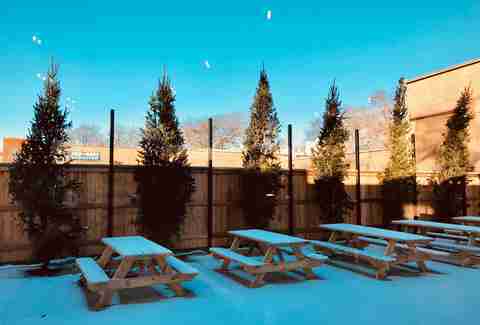 While some of the more old-school purists may grouse at Fischman’s attractive new vibe, the neighborhood gathering place is catching on nicely while attracting a diverse mix of families, hipsters, beer nerds, and everyone in between. Easily No. 1 on the list of bars frequently mistaken for an Ayn Rand homage (it isn’t, though there are some parallels... you know, just hit their website and read their explanation if this is a sticking point). The mahogany-enveloped interior makes for a fantastic backdrop to hole-up for a pint in the cold. The rooftop garden is gorgeous for the two months that it’s nice outside. You could be forgiven for allowing yourself to be distracted from its ridiculously stout 27 tap, 118 bottle, and 49-can strong beer list by the food menu (don't skip the pub cheese) and the equally robust selection of whiskies, but don't be, because the beer list is always fantastic. If you're really indecision prone just stay a while and consume everything, especially if you've scored a rooftop table. The reverberating heavy metal and serious brew selection here will make you completely forget that just before you entered, you saw a nice-looking couple walking their French bulldog down a sleepy, tree-lined street in Lincoln Park. 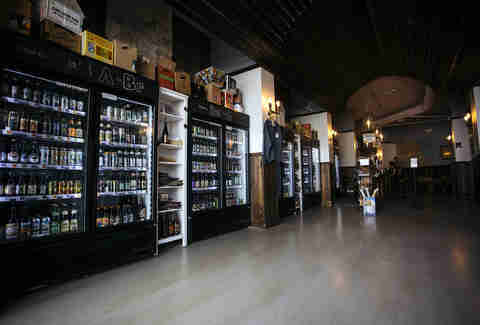 If you can’t find something you like amongst their 28 draft options (highly unlikely), there’s also an impressive bottle selection (rarer large-format options in particular) and surprisingly diverse pub menu featuring everything from creole wings to swordfish tacos. Really, though, you’d be remiss not to sample at least one of the house-branded options (!) they make at other Midwest breweries. This little dive doesn’t quite have room for fermentation tanks. 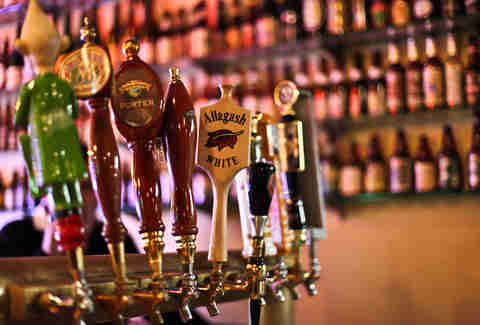 Since the 2018 demise of Howells & Hood, this Old Town hotspot claims the mantle for the most taps in Chicago with an eye-popping 90 (mostly American craft) varieties from which to choose. If you can’t decide, try a themed beer flight made up of staff favorites or build your own with the help of the 6-ounce pours that are available for any of their beers. The space is equally as massive as its tap list, with rich mahogany and flatscreens offering an upscale pub feel to be paired with bar eats that include somewhat ridiculous items such as crab fondue and filet mignon sliders. It’s also one of the best sports bars in the city, so get their early if you’re looking to Bear down on Sunday. One of Chicago’s best new bars is also one of its best new beer bars, with an expertly curated 44-strong draft list lovingly assembled by the team behind The Whistler, one of Chicago’s best cocktail (and most hipster) bars. The hipster vibe is equally on point at this Avondale space located inside a former cabinet store, which includes a 300-capacity music venue hosting some of the finest indie acts in the city. But you’re equally as likely to get into a heated discussion about hops as you are the latest Pitchfork review, thanks to its devoted patrons who aren’t afraid to showcase their high beer IQ. 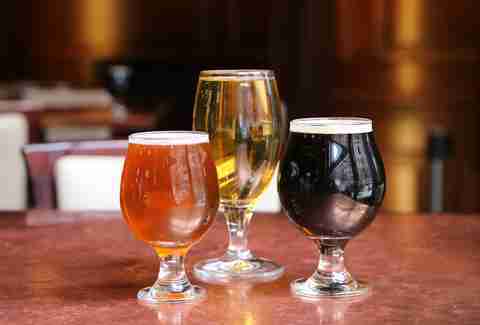 Yet beer novices need not fret, as the friendly staff is more than happy to guide you along. 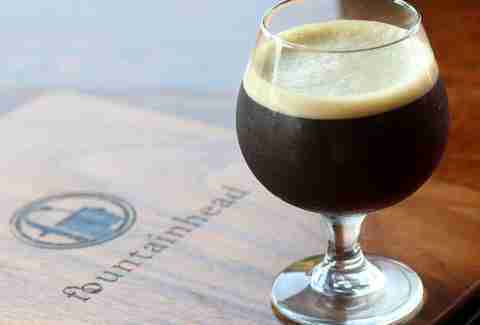 Bonus: They also serve a 13.5% ABV mead, so you can drink like a Medieval Times knight. This gorgeous bi-level space brings a touch of class to the subpar River North craft beer scene, which has received quite a boost since this food-focused spot opened in 2017. 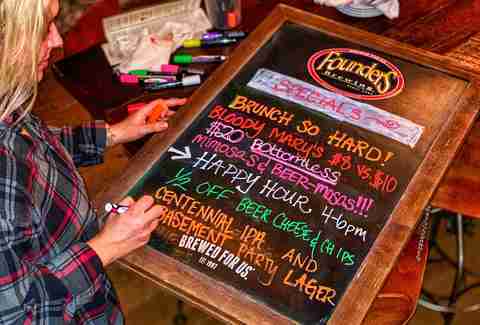 Housed inside a 130-year-old building of handsome hardwood floors, exposed brick, and a reclaimed 1940s Brunswick bar, Centennial features 56 draft lines serving 36 regularly rotating craft beers alongside 51 bottles and cans. With beer flights and a classic yet cozy feel, their ales are meant to be paired with chef-focused eats including lamb flatbread, wild boar bratwurst, and a standout house-ground 8-oz burger. Stop by for weekend brunch or buckets of beer on football Saturdays. There’s nothing too fancy about this little beer temple opened in Wicker Park in 2014, but that’s the way locals like it. 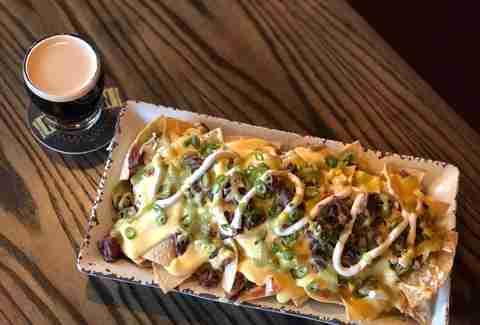 With both a look and a “craft beer and craft sausage” concept similar to that of nearby Bangers & Lace, Links caters to a more diverse crowd from beer nerds to the beer illiterate, who can learn more about the bar’s 36 American craft draft beers from digital screens behind the bar. They’re also serving up a few cask beers and wines on tap, in addition to a healthy selection of cans and bottles heavy on large formats meant for sharing. Besides a variety of housemade sausages, they’re also dishing out excellent hand-cut fries and even offer a perch fish fry on Fridays. Much like the South Loop neighborhood it calls home, First Draft isn’t trying too hard to be cool or trendy. It’s just a solid, convenient neighborhood hangout in a simple, unpretentious space that just so happens to have one of the deepest selections of draft beers in the city. With 64 draft lines to choose from, it’s a cozy space to gather with friends to watch sports on the many TVs or get adventurous by exploring the long line of taps behind the bar. The decent if not life-changing eats include comfort food staples like pizza, burgers, and mac & cheese, with weekend brunch featuring a Bloody Mary bar. So if you want to dive into some great craft beer without making such a fuss about it, this is your place.